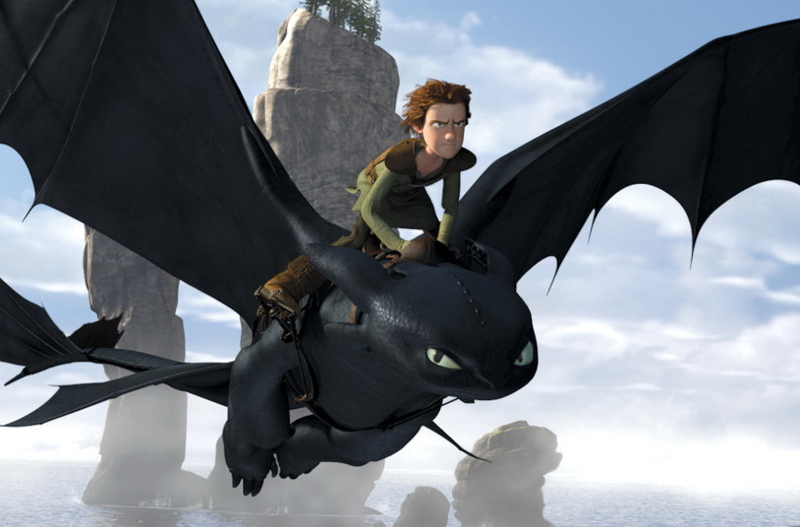 This article is a review of HOW TO TRAIN YOUR DRAGON. The title could make a person think this is an allegory for overcoming heroin addiction, but it’s actually the latest animation extravaganza to hit the multiplexes. You’d perhaps feel that producing a cartoon would be cheap and easy, just pay some animation monkeys with Dr Pepper and Haribo and let them knock one out; however these things usually take about four years and supposedly here cost $165 million (WALL·E $185 million and SHREK 3 $200 million allegedly). Also, don’t let the fact that anything drawn lull you into believing this is only kiddie entertainment. Surely there are enough animated films out there to disprove that theory? Vikings. An awesome subgenre. Add to that lots of dragons. Well, could this be a winning formula for thrills? A Viking village on an island is regularly attacked by these scaly foes. 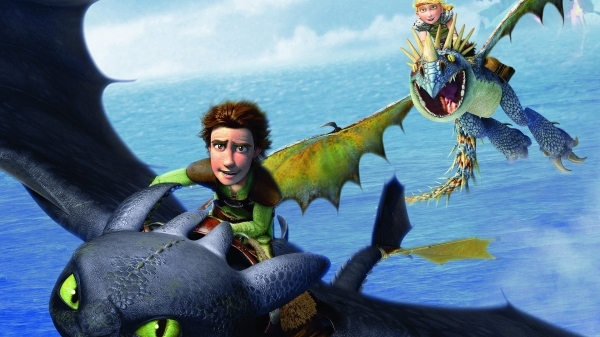 Respect and achieving adulthood are judged purely on the ability to capture or kill the dragons. 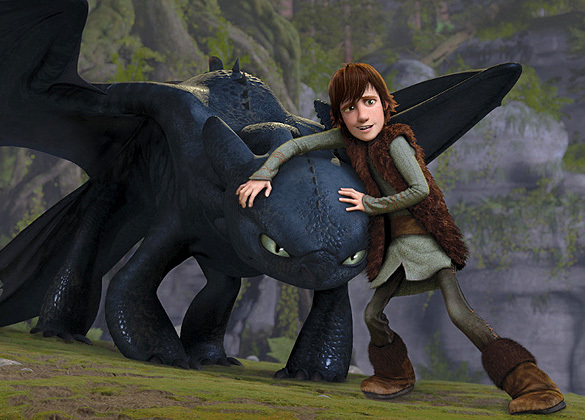 One particularly inventive and sarcastic teenage member of the community, Hiccup, is a little rubbish at this task, though he wants to prove to himself, his father and those around him that he is up to it. So far so typical: the lone misfit on a quest. But hold your horses there, what turns this into something more interesting are the traits of mercy and compassion, coupled with determination and resourcefulness, to make a compellingly atypical hero. In befriending an adversary he then starts to excel, and there are some obvious political parallels to be drawn. And like WALL·E, the film is richer for it. 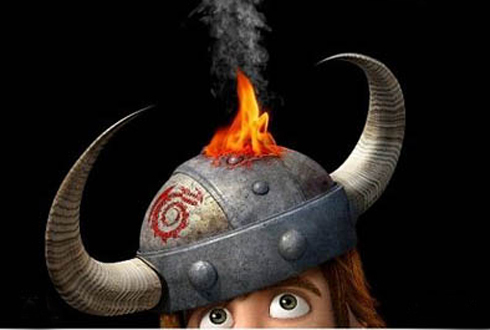 Some movies purport to be action romps. Stand up at the back ASTRO BOY and MONSTERS VS. ALIENS. The truly exciting ones are rare. Take a bow VEXILLE and THE INCREDIBLES. While not as accomplished as the latter, the audience will certainly be wowed by the soaring camera movement and gorgeous cinematography, coupled with insanely detailed animation (the animation monkeys are the real stars); all enhanced by the IMAX screen. One of the few 3D films so far worth forking out the extra wad of dough for.